Russian peasants used to wear lapti (bast shoes), whereas in towns high boots were the most common footwear. Heeled boots appeared in Russia somewhat in the 14th century. The high boots were usually square-tipped, whereas the nobles were distinguished by upturned toes. The tops of the boots were comparatively short and angularly cut towards the knees. They were sewn of coloured leather, morocco, brocade or velvet and were often decorated with embroidery and even gems. In the late 17th century under the influence of western fashions the nobility started to wear low shoes. 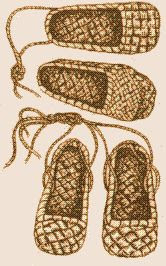 In Russian self-perception the braided footwear known as lapti is one of the most important symbols of the traditional national mode of living. The lapti made of bast or birch bark were the main type of peasant footwear in Russia till the mid 19th century. The lapti were worn with the onucha, i.e. a puttee, a strip of cloth wrapped round the foot. The onucha was fastened to the leg with a bast lace fixed to the shoe and was twined up around the shin in the manner of the Old Greek sandal. Nevertheless, when walking for a long time one had to rewind the onuchas. The lapti making was a peasants’ winter occupation, when they had no field works to do. The laying-in of bast took place in summer, when bast had all the required strength properties. The newly braided lapti were stretched on a single last, so the right and the left one were the same. To make one lapot one needs seven bast stripes two meters long each. One bast stripe was to be as wide as a thumb of the man who gathered it and then made the bast shoes. For making the shoes they needed bast from the even part of a linden trunk, without any defects along the full length. It means that mature, tall and even linden trees were chosen for barking. Frequently after the summary loss of its bark the tree would die and remain to stand with its naked “stripped” trunk. The sorrowful fact found its reflection in the Russian figurative expression: “to strip like a linden”, which means to deprive somebody of all the needed resources and thus endanger his/her life. Since leather boots were always expensive and only well-to-do people could afford it, while the poor wore lapti, so the bast shoes came to symbolize poverty, and low birth, as well as lack of culture and backwardness. Hence is the number of set expression in the Russian language: * “lapot” as a trope stands for a simpleton, an ignorant person; * the derivative attribute “lapotny” of the same meaning; * “Methinks, we don’t sup soup with a lapot”, (rough translation) means “we are not just out of the trees, so don’t you teach us how to live”. Bakhily (aka bredni, brodni, butyli, lovchagi, ostashi, sapogi cherepanskie) are men’s working and fishing footwear made of leather. 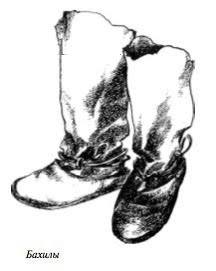 These were soft leather jackboots with high tops to the knees or thighs. The bakhily were usually made on the straight last, i.e. the same for the right and the left foot. Soft leather soles were stitched to the boots with an axed thread, and then the boots were turned out. The tops were also made of soft leather, with one seam behind, and were fastened onto the leg with a strap. The strap was put through a small loop or a ring stitched to the back part, and was twined up round the leg and tied under the knee. To make them more durable and protect feet from moist the bakhily were dubbed with tar and fish oil, and soaked in slated water; additional straps of leather were lined to the toe and the back part. In some parts of Russia “bakhily” was also the name of working footwear on solid nailed soles or footwear made of skins of sea animals or calves, but with soles of seal skin. The tops in all the cases were also soft and long and fastened onto the leg with straps. Bakhily were usually put on woolen socks or stockings. Insoles of soft hay were put inside. The bakhily were usually worn for fishing, hunting or any other crafts. Soft turned-out jackboots were typical footwear in Russian villages. They were known as far back as 10th century as footwear of the townsfolk. Valenki (aka valentsy, volnushechki, vykhodki, pimy, katanki, or felt boots) are men’s and women’s winter footwear fulled of sheep wool. These are felt footwear with high tops, round toes, and flat soles without high heels. As a rule they were made on one last, the same for the right and the left foot. The tops reaching knees were usually not turned down but slightly cut for more comfortable walking. The soles were often lined with leather to prevent the boots from soaking wet. The valenki could be grey, brown, black, or, more rarely, white. White felt boots were embroidered with coloured worsted or beads. They were fooled by special masters, called katali or pimokaty. 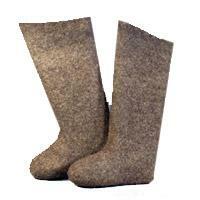 In every province there were a few villages that specialized in felting boots. Along with that there were large centres of felt boots manufacturing; their products were distributed far beyond the limits of one province. Thus, for example, in the north-east of European Russia and in Siberia the so-called kukhmorski valenki were famous; those white embroidered felt boots were made by masters of Malmyzhsky District of Vyatka Province. In spite of being very famous as Russian national footwear the valenki are comparatively young footwear in Russia. They appeared in Siberia in the mid 18th century, and came to European Russia in the early 19th century. In the 19th century the valenki were holiday footwear of wealthy peasants. White embroidered valenki were holiday footwear only of very rich peasants. In the late 19th and early 20th century felt boots got widely spread, becoming basic winter footwear of peasants in European Russia. The felt boots with the leather sole sound as though they would be the warmest. Hello my sweet friend, congratulations, very good your blog. I am Speaker from Argentina and I invite you to listen to the best romantic ballads in the world with my voice and my blog. From Saturday, June 11, i'll do a tribute to Russia. I hope that your visit. A warm hello to you. A fascinating blog to stumble upon! I cannot read or speak Russian, but I recently published a book about anti-Communist literature in America for which I had to read (in English or French) numerous memoirs of the gulag. Under these circumstances I began to develop a rudimentary Russian vocabulary: what might be called a zek's word-frequency list. The top ten words all had to do with things needed merely to keep alive, and one of them was "valenki".